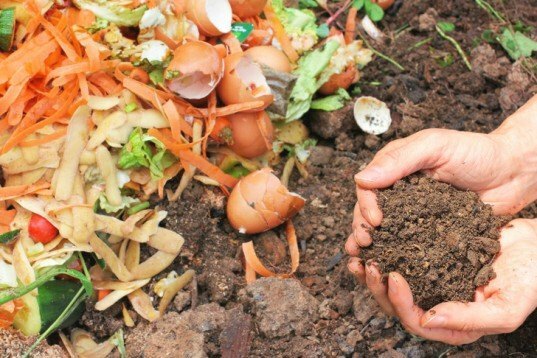 Many cities around the world now have composting programs so household food scraps and garden clippings can be mulched rather than ending up in landfills. This is a great practice, but there are also a lot of places that don't have a program like this, including the little village I currently live in. 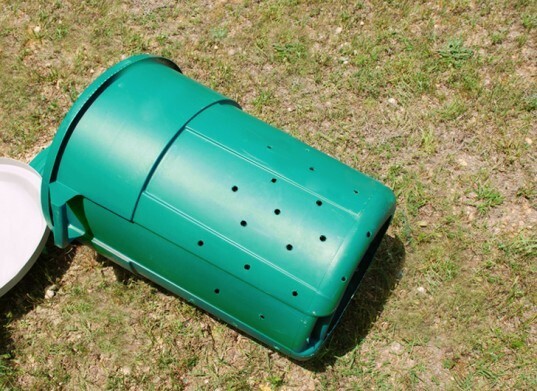 Whether you're a country bumpkin living on the edge of a forest (like us) or a suburbanite with a bit of yard space to play with, it's actually quite simple to create a compost bin of your very own: all you need are a few low-cost items from the hardware store. Use the drill to create holes all over the plastic garbage can, including the lid and the bottom to allow air to circulate through. You can space these holes out at regular intervals, or get cheeky and create designs or words with them. By the time you’re done with it, this aerated bin will likely look as though a very bad marksman has been using it for target practice. The holes will be small enough that worms and other small insects can get in, but rodents can’t. Once done, you’ll set the bin atop a couple of cinder blocks to let circulate through the bottom, and also to allow any excess liquid to drain out of it. Start your bin by pouring a good 5 to 7 inches of dry leaves into it, followed by a handful or two of green/nitrogen materials. Pop the lid on that bad boy and secure it with the two bungee cords in a criss-cross pattern. Roll it around your yard a little bit to mix the green with the brown, and then set it back on its blocks to aerate. You’ll want to roll it at least once a week to ensure proper aeration, especially as you add more to it. Now, most resources will recommend that you have a 25:1 or 30:1 ratio of carbon:nitrogen (or brown:green) in your composter so you don’t end up with a stinking, slimy mess, but it all depends on what’s going into the bin. Some materials have higher carbon content than others, some scraps will take longer than others to break down, etc. ad nauseum. I don’t math well, so I just try to ensure that for every handful of green/nitrogen scrap I toss in, I add several large handfuls of brown/carbon to balance it out. So far, it’s all worked out just fine. 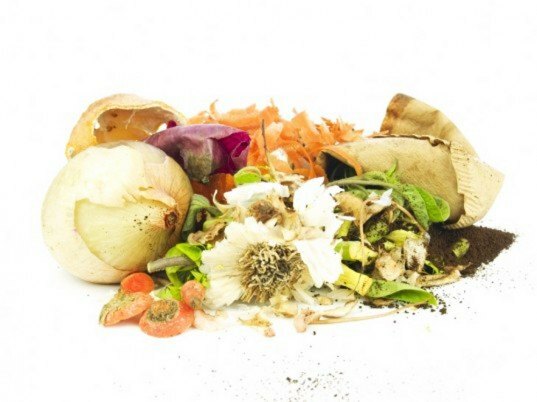 It’s best to do a bit of research when it comes to what can and can’t be composted, as there are many different lists online that contain every bit of compostable material imaginable, from cooked pasta to masking tape. Some items can be composted if your pile gets hot enough to break it down, but that’s a bit more high tech than the average backyard gardener wants to get. Personally, since I’m creating compost to be used in my vegetable and herb gardens (which are full of organic and heirloom plant varieties), I try to make sure that I only compost items that I’d like to use to feed my plants, and by extension, my family. You are what you eat, right? Fruit peels and scraps, (apple, pear), but I don’t add citrus peels to mine. Some sources say you can (except for limes), but I tend to err on the side of caution and leave them out. Crushed nut shells, and any ground nuts left over from making milk (ground almonds, hazelnuts, etc.) Whatever isn’t baked with afterwards can be added to the pile. Wood ash from the fireplace (used very sparingly, and mostly for pest control: most of my wood ash goes onto acidic areas in my garden to amend the pH levels there). It may take some time to establish a proper balance in your bin, but be patient, and just adjust things as they move along. If you find that your compost smells gross and seems a bit too wet, add a bunch of dry/carbon materials and let things rebalance themselves. Should you find that things aren’t breaking down properly, you might need some more green materials: throw some dry grass and vegetable peels in and give it a good roll. If you’re diligent about tending your compost pile, the “black gold” that’ll form will be invaluable for your garden. It’ll take 2-3 months for everything to break down into usable compost, and the end result should have a rich, earthy, forest-y scent. Compost is so full of nutrients that it’ll nourish your plants into strong, healthy edibles. You can create compost tea from it as well, to help treat common plant maladies and give a vitamin-filled boost to your garden, like a superfood smoothie for your plants. What are your favorite composting tips and tricks? Use the drill to create holes all over the plastic garbage can, including the lid and the bottom to allow air to circulate through. If you find that your compost smells gross and seems a bit too wet, add a bunch of dry/carbon materials and let things rebalance themselves. Should you find that things aren't breaking down properly, you might need some more green materials: throw some dry grass and vegetable peels in and give it a good roll. It'll take 2-3 months for everything to break down into usable compost, and the end result should have a rich, earthy, forest-y scent. If you're diligent about tending your compost pile, the "black gold" that'll form will be invaluable for your garden.